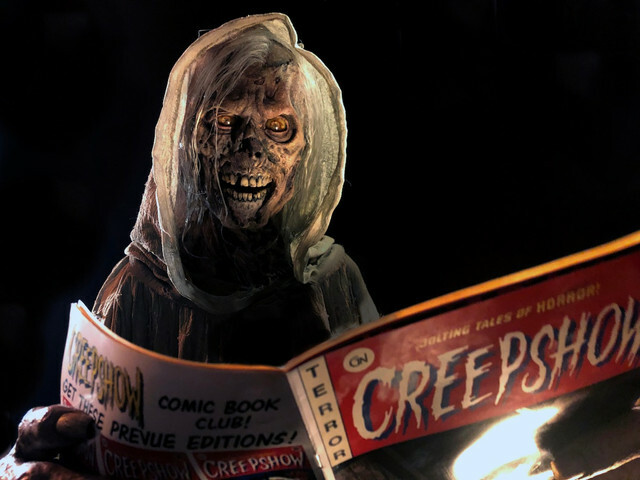 The Very Latest On Shudder's CREEPSHOW Within! With “Gray Matter,” Shudder has confirmed eight of the twelve segments that will make up CREEPSHOW'S six-episode season. Previously announced segments include “By the Silver Water of Lake Champlain” by Joe Hill, “House of the Head” by Josh Malerman (Bird Box), “The Companion” by Joe Lansdale, Kasey Lansdale, & Keith Lansdale, “The Man in the Suitcase” by Christopher Buehlman, “All Hallows Eve” by Bruce Jones, “Night of the Paw” by John Esposito, and “Bad Wolf Down” by Rob Schrab. Additional titles and casting will be announced soon. The series is scheduled to wrap production later this week in Atlanta, GA.
Shudder’s CREEPSHOW is produced by the Cartel with Monster Agency Productions, Taurus Entertainment, and Striker Entertainment: Stan Spry, Jeff Holland, and Eric Woods are executive producers for the Cartel; Greg Nicotero and Brian Witten are executive producers for Monster Agency Productions; Robert Dudelson, James Dudelson and Jordan Kizwani are executive producers for Taurus Entertainment; Russell Binder is executive producer and Marc Mostman co-executive producer for Striker Entertainment. CREEPSHOW will premiere on Shudder later this year.